Every mother knows that if you give a child dirt, water and a sunny day, you will have a mud pie. It is an innate quality and need of mankind to work the earth with his hands. The remarkable winegrowers of Mendocino County comprise a unique collection of small, family-owned and carefully tended vineyards that truly exhibit this creative need to work the land and craft world class wines. Mud Pie wines are committed to sourcing and working with these dedicated artisans. Mud Pie is an endearing tribute to the best Mendocino County has to offer. The pale color of this Rosé is the result of super gentle whole cluster pressing of the Grenache noir grapes from our estate hilltop vineyard above the Ukiah Valley. The nose holds citrus blossom and lemon meringue, and its bright acidity will excite any palate and pair well with a large variety of foods. Invigorating and bright summer nose of tropical fruits and lemon. Mouthwatering blend of crisp but full flavors including melon and guava. Light exposure to oak adds complexity to a fresh and delicious example of Chardonnay. This is a fruit forward wine – it greets the nose with raspberry and dark cherry. Vanilla oak tones serve as a backdrop. The mouth is pleasingly round, the tannins are gentle, and the jammy fruit is complemented by light black pepper. Enjoyable with food or on its own. Wine greets with a beautiful garnet color and nose of vanilla custard, fresh ground black pepper, and ripe plum. The mouth holds bright acidity, fresh cherries, and a solid backbone of integrated tannin. Deep garnet in color, this wine has aromas of black fruits and cedar which compliment the dusty herb and spicy berry flavors in this mouth filling vintage. The soft tannin and acidity make this a Cabernet that is approachable and ready to drink now or save for later. Mud Pie is available for online purchase at select retailers nationwide. Click the button below for a complete list of online retailers. 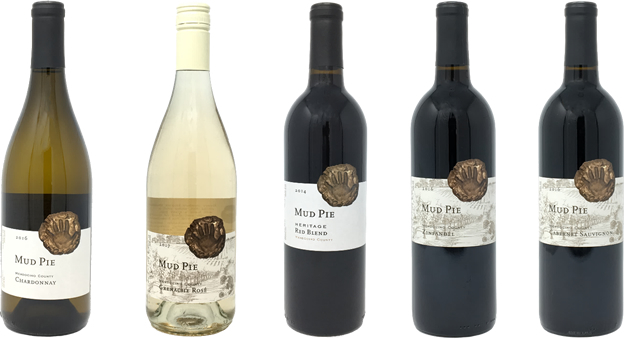 Mud Pie is available for in-store purchase at Costco in Ukiah, CA. Get Directions. Mud Pie is also available for in-store purchase at select retailers nationwide. Click the button below to find a local retailer near you.